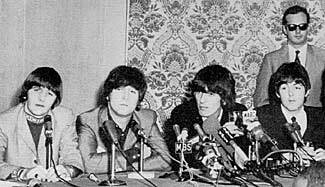 ABOUT THIS PRESS CONFERENCE: The Beatles and their entourage flew into New York City on Friday August 13th 1965 as the very first stop of their current North American Tour. The group held a press conference with reporters upon their arrival. 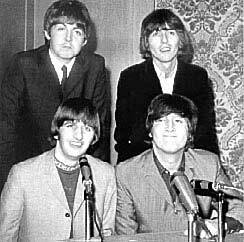 Saturday the 14th was reserved for the taping of their 1965 Ed Sullivan Show appearance. 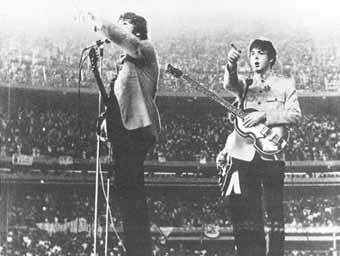 The Beatles then gave their historic performance at Shea Stadium on Sunday August 15th. Their second movie 'Help' had premiered in New York City just two weeks before their arrival. While the Beatles had packed smaller stadiums on previous tours, their concert event at Shea Stadium broke the world's record for ticket sales. It represented a sudden shockwave of realization that rock concerts could now sell out the largest venues imaginable -- a legitimate 'first' for the Beatles. 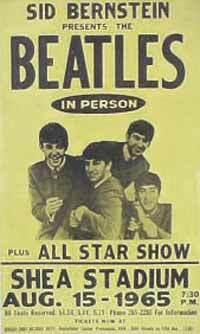 The group's performance at Shea was arranged through promoter Sid Bernstein, who later would be turned down in 1976 by the four ex-Beatles on his staggering offer of 100 million dollars for a Beatles Reunion tour. Following the build up in excitement from the supporting acts, Ed Sullivan finally appeared to personally introduce the Beatles, and the mania in the crowd reached a fevered pitch. The Beatles appeared from the dug out, ran out onto the field, and up onto their stage which had been positioned at second base on the stadium's baseball diamond -- appearing before 55,000 shrieking fans. The concert was of such completely unprecedented size that the most powerful sound technology available in 1965 could not handle the massive stadium. Even the amplifiers which were designed to deliver increased power specifically for the Beatles' Shea Stadium appearance could not keep up with the size of the screaming crowd. The stadium's P.A. system, normally used by baseball announcers, was also incorporated in a last minute attempt to support the volume of the sound in the stands. None of this appeared to matter to the fans, who were enraptured by being so close to their idols. The following press conference was held at the Warwick Hotel in Manhatten on August 13th as the kick off of the new tour. Certain reporters who had written them off as a short-term fad on the previous year's tour now were beginning to take a slightly different tone. Their world record breaking event at Shea Stadium would raise the bar for rock concerts, and make it impossible for skeptics to deny the endurance of Beatlemania. Q: "John, you're the chief Beatle. What is the duty of the chief Beatle?" JOHN: "Uhh, nothing. Nothing I can think of. I was just tagged chief Beatle." RINGO: (jokingly) "It's 'cuz he's the oldest." JOHN: "I don't do anything extra, you know." M.C: "Okay, let's go with the first question, please." Q: "How does it feel to be back in the States?" Q: "John, do you always do press conferences chewing gum?" JOHN: "Uhh, no. Only in America." Q: "Only in America you chew gum?" JOHN: "'Cuz people give you gum all the time over here." Q: "Are the Beatles the answer to Prime Minister (Harold) Wilson's export drive?" JOHN: "We're one of the answers. One... of... them." Q: "Since you were made a Member of the Order of the British Empire has it changed your lives in any way?" JOHN: "Uhh, not yet, 'cuz we haven't really received it yet." Q: "Will it change your lives?" RINGO: "We'll just have a medal to wear." Q: "Ringo, what are you gonna name the baby if it's a boy or a girl?" RINGO: "That was John answering, not me. We don't know yet. We're still talking about names." Q: "Is your popularity fading?" JOHN: "Go and ask the record people." RINGO: "Well, you all seem to be back again." JOHN: "Just ask the record people." Q: "George, lots of people in this country and others are comparing you boys with those who usually are pace setters in op art and pop art and classical music-- even so far as to go to compare you with Gouneau. Now, how do you react when you hear that kind of thing?" JOHN: "Never heard of him." JOHN: "We don't mind being compared with anybody." Q: "You think you're that type of musician?" JOHN: "No. I mean, if people wanna compare us, they can." Q: "Do you think you're setting styles in pop and op art?" RINGO: "Yeah, we're always unconscious." Q: "Is matrimony in the immediate future for the two unmarried members of your group?" PAUL: "Matrimony is not in the immediate future." GEORGE: (jokingly) "Paul won't have me." Q: "I noticed the two married men are sitting together, and the two single boys are sitting together." JOHN: "That's 'cuz we're queer!" RINGO: "But don't tell anybody, will you? It's secret." Q: "What were the sunglasses you were wearing this afternoon, John?" Q: "No. I mean, were they special? They were green." JOHN: "I just found 'em in... umm..."
JOHN: "...Cannes. They're just sort of ordinary sunglasses, only they've got mirror on one side, so nobody can see in." Q: "Are the American fans the most enthusiastic?" GEORGE: "There's more of them, so it appears that way." Q: "Who are your most enthusiastic fans?" JOHN: "The ones that are nearest." PAUL: "Well, they're all enthusiastic but it depends on the size of the country. In this case-- the biggest." Q: "Is there any possibility of you changing your style of performance?" RINGO: "I told you... we're always unconscious." Q: "How do you feel about the teddyboys coming here?" JOHN: "I don't know. I don't feel anything, you know." Q: "What happened in the Bahamas?" JOHN: "Which bit? We were there for weeks." Q: "There were reports that you cut it up." JOHN: "We made a film." PAUL: "What do you mean, 'cut it up?' (pause) He said, 'Is it true you cut it up in the Bahamas?' And I said, 'What d'you mean, cut it up?" Q: "Any plans to visit any countries behind the Iron Curtain?" PAUL: "No, not at the moment." Q: "Any plans for going to Vietnam and entertaining the troops?" JOHN: "I wouldn't go there, no." Q: "Did you fellas do your own skiing in the (Help!) motion picture?" JOHN AND PAUL: "Some of it." PAUL: "The clever bits we didn't do." GEORGE: "We did the bits falling over. The falling over bit." Q: "Who do you consider the best actor among you?" Q: "Is this movie as good as 'Hard Day's Night'?" JOHN AND PAUL: "It's better." Q: "John Lennon's press release says that Ringo..."
JOHN: (jokingly) "Hey, hold it here! What's happening, man!" RINGO: "Put your hands up and we'll snap 'em off." Q: "You Beatles have conquered five continents. What do you want to do next?" PAUL AND JOHN: "Conquer six." Q: "How much money has the group made since you organized?" JOHN AND RINGO: "We don't know." Q: "Any new gimmicks for the show that you're gonna do?" GEORGE: "I don't think so, no." Q: "Are you bored with being the Beatles?" Q: "The American press has compared you the Beatles with the Rascals. Have you heard of them, or seen 'em?" PAUL: "We've never seen 'em." Q: "George or Paul, have you worked up any new routines for the American concerts?" GEORGE: "Well, we've changed the, you know... We're doing lots more different songs from last time."